Tom Reardon (Kiefer Sutherland), Ian Campbell (Robert Carlyle) and Dusty Miller (Mark Strong) have differing responses to their horrific situation. What do these responses say about survival? Which response makes the most sense to you and why? How does knowing that this story is based in history affect how you experienced the film? Captain Ernest Gordon and Imperial Translator Takashi Nagase amazingly had a history together after the war. They both met at the Death Railway Cemetery in Thailand 55 years after being on opposite sides in the POW camp. How can we account for this? Dr. Coates said that escape from the camp was impossible. He meant a literal escape, but how and why did some of the prisoners 'escape' through education? Major Ian Campbell's life was spared, yet he couldn't seem to fully appreciate this act of compassion. Why? Dusty Miller's character becomes a Christ figure in the movie. What were the essential factors that led to his self-sacrifice? How did his death affect others? Is it easier or harder to forgive your enemies in a WWII POW camp or in today's world? 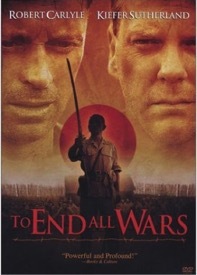 What Biblical stories were you reminded of while watching 'To End All Wars'? How did the values of the Scottish military regiment help the soldiers survive the brutal hardship of the camp? How did it hinder their well-being? Compare the bushido discipline of the Japanese to the Allied point of view. How were they similar? How were they different? What made the 'jungle university' different than how we normally experience university today? Ernest recounts at the end: "When you see yourself in the eyes of the enemy, at what price mercy? Who is my neighbour? What does it mean to love one's enemies? How often do I forgive? These are the questions I faced in prison camp. The answers I found changed my life." Are these our questions too? What did it mean that a 'single life weights less than a feather'. What were the consequences of this belief? Philosophy and religious reflection were crucial for the survival of these men. Do you think this is true today? Why or why not? "You know, a man can experience an incredible amount of pain and suffering if he has hope. When he loses his hope, that's when he dies. "—Dusty Discuss.